When I put this outfit on I was like ok this would look awesome with the typical minimal two strap black heel, seen here. I decided to switch it up with a tan bootie instead, hoping it would still give the elongated leg effect without looking completely typical. I’m not sure I love the result but I do like trying new things. I wore this to work last week without the blazer. This outfit is another example of why I think it’s worth it to spend some money on a few good tops. I own many of varieties of t-shirts but when it comes to an interesting blouse per say the selection is limited. I DO NOT enjoy buying tops but I did kinda force myself to get this one from Anthro last year. I’ve worn the hell out of it to work and on the weekends. Give me some solid stripes and a lace collar and I’m good to go. I’ve also had this rad mint watch for a while but never really worn it because I needed a link taken out. Nordstrom usually does this for free but I was sent over to Timex and they did it for $15 which I was kinda bummed about but I can’t complain because my watch is now wearable. There is one post where it appeared in, see it here lol. Also this shoot was super awkward because I made my BF walk over to this spot on my lunch break in 100 degree heat and told him there was this cool door that would make a good photo opp. I mean look at those rad window panes?! It turned out to be a law office and the lady came out and was like uggh can I help you? I’m no thanks were just photographing the door. She looks at the door shrugs and closely it on us haha. Next time I’ll be sure to shoot here on the weekends. Do boots and blazers work together? You be the judge. I think this looks is a keeper! Love it with the booties! love this outfit!! and i can’t even count how many times people have asked what i am doing while taking photos at a random place haha! This is my outfit inspo for tomorrow, thanks! You have literally perfected winged liner. Seriously. 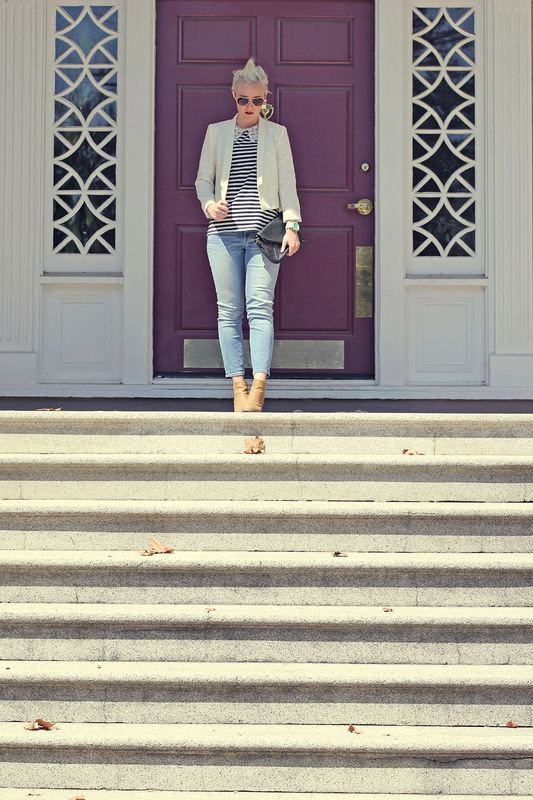 Love Anthropologie and love this outfit. Wow! So Gwen Stefani, you look so chic! love this whole look! 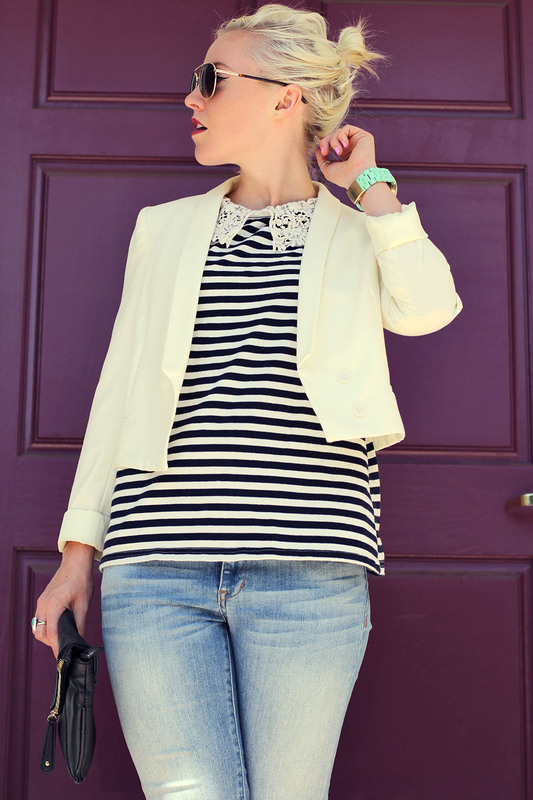 so chic with stripes!